Radiology View: What’s Your Read? A 13-year-old, spayed female, Golden Retriever presented for vomiting, lethargy, and suspected discomfort. Cranial abdominal discomfort was noted during the physical examination. The following radiographs were made. 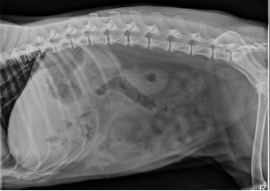 What are your radiographic findings? What would you suggest as your next step for this patient? Figure 1. Lateral abdominal radiograph. Figure 2. Ventrodorsal abdominal radiograph. There is a loss of abdominal serosal margin detail indicating the presence of peritoneal effusion. Free abdominal fluid almost always warrants further investigation as to the underlying cause. In this case, this is especially important due to the history of abdominal pain. With the combination of abdominal pain and peritoneal effusion, pancreatitis, or peritonitis should be considered. There is also an atypical gas pattern within the cranial abdomen. This gas pattern is atypical for gastric gas and occupies an area larger than what would be expected for a normal pylorus; especially given the size of the gastric fundus relative this region. Emphysematous cholecystitis is a possible differential based on the lateral projection; however, this is not confirmed on the ventrodorsal projection as the atypical gas pattern is not identified within the right cranial abdomen in the expected location of the gallbladder. Close evaluation of the ventrodorsal projection reveals that this atypical gas pattern is seen superimposed over the region of the gastric fundus. Using both projections together, this atypical gas pattern can be localized within the ventral aspect of the left cranial abdomen. Anatomy tells us this region of the abdomen is occupied by the liver rather than the stomach. See figure 3 and 4. This type of gas pattern within the liver indicates the presence of a hepatic abscess. The presence of peritoneal effusion indicates concurrent peritonitis. 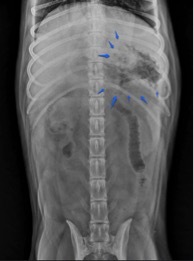 Evaluation of the small intestine is partially limited by the decrease in serosal margin detail; however, the small intestine remains normal for size and distribution. The diagnosis of a hepatic abscess in this case is difficult because of the location of the hepatic gas relative to the stomach. An abdominal ultrasound would be an appropriate next step for this patient given the presence of abdominal pain and peritoneal effusion alone. The hepatic abscess would have been easily identified with ultrasound even if a diagnosis of a hepatic abscess was missed on the radiographs. Surgery is often recommended to treat a hepatic abscess; however, there are reports that hepatic abscesses have been successfully managed medically. The need for surgical versus medical management would partially depend on the clinical status of the patient. In this case, surgery was performed and the hepatic abscess was successfully removed. The removed portion of the liver was cultured and the patient recovered using appropriate antibiotic therapy. Figure 3. Close evaluation of the ventrodorsal projection reveals that this atypical gas pattern is seen superimposed over the region of the gastric fundus. Figure 4. Lateral abdominal radiograph. 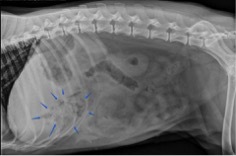 Using both projections (figure 3 and figure 4), this atypical gas pattern can be localized within the ventral aspect of the left cranial abdomen. Anatomy tells us that this region of the abdomen is occupied by the liver rather than the stomach. This type of gas pattern within the liver indicates the presence of a hepatic abscess.